TV station's general director says, "This is a political issue"
(CNN) -- The government of leftist Venezuelan President Hugo Chavez heightened its battle Tuesday against the only critical private broadcaster left in the nation, launching a fourth investigation into the Globovision network. 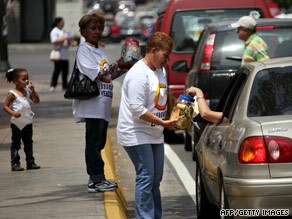 Globovision supporters ask for money last week in Caracas to help pay a fine against the TV network. Two officials with Venezuela's Conatel agency, which regulates the nation's telecommunications, served the papers at Globovision's station in Caracas. CNN affiliate Globovision aired the proceedings live. Venezuela's government said in Tuesday's complaint that the station broke the law of "social responsibility" on some programs on certain dates. The station violated a statute that makes it illegal to use telecommunication channels to further criminal acts, said Roselyn Daher, one of the government officials who served the complaint papers. She made her comments Tuesday on the state-run VTV network shortly after serving the papers. Globovision officials said the charges are politically motivated. "This is not a judicial matter," said Alberto Federico Ravell, the station's general director. "This is not a matter of rules. This is not a matter of laws. This is a political issue." Antonio Ledezma, the mayor of Caracas and a Chavez opponent, said Tuesday the government is "trying to criminalize public expression." Venezuelan authorities opened an investigation last month into whether Globovision broke the law May 4 when it reported about an earthquake before an official report had been issued. Two earlier probes had been launched against the station. The government has taken a series of other steps in the past few weeks against the station and its owner. In early June, Venezuelan officials arrived at Globovision to accuse the company of not paying about $2.3 million (5 million bolivares fuertes) in taxes for certain advertisements it aired in 2002 and 2003. About 12 hours earlier, national guard troops and authorities from Venezuela's environmental agency staged a late-night raid on the Caracas home of Globovision President Guillermo Zuloaga, an avid hunter, to see whether he had killed any protected prey. It was the second raid on Zuloaga's home in two weeks. Zuloaga, who owns two Toyota dealerships, also was charged this month with overcharging on 24 cars he had sold and was storing on his property. Those vehicles were seized in a May 21 raid. Zuloaga has denied the accusations, saying they are politically motivated. "This is something to try to scare Globovision, to silence Globovision, something they are not going to achieve," Zuloaga said as he emerged from a hearing two weeks ago in which he was charged. "Let the government know that silencing or closing communication media is not a way to hide what is happening." Venezuelan officials repeatedly have denied any political motives. Chavez has labeled as "terrorists" any TV station owners who criticize the government. Some outside observers see outright abuse. In a joint release in May, the United Nations and Organization of American States said they are worried about Venezuelan government statements on Globovision that "generate an atmosphere of intimidation in which the right to freedom of expression is seriously limited." RCTV, another independent station that criticized Chavez, lost its broadcast license two years ago. The station had to go off the public airwaves and transmit solely on cable. Other TV stations seemed to have gotten the message, a watchdog group said. The watchdog group's conclusion: "After years of 'media war,' Hugo Chavez and his government took control of almost the entire broadcast sector" in 2008. The government's actions are not limited to TV stations, critics point out. Two well-known political figures were recently charged with corruption. Manuel Rosales, the mayor of Maracaibo, fled to Peru in April after being charged with illegally enriching himself while governor of Zulia state. Rosales was a leading political opponent who lost the 2006 presidential race to Chavez. Earlier, authorities arrested former Defense Minister Raul Baduel. He had played a key role in turning back a coup attempt against Chavez in 2002 but broke with him in November 2007 over constitutional changes that Chavez was proposing. Baduel, who also was the president's military general in chief, was arrested at gunpoint in front of his wife on April 2. It was Baduel's second arrest on charges that he stole $14 million from the armed forces. Analysts said they see a pattern. "The most prominent opposition figures now all have corruption investigations going on," Jennifer McCoy, director of the Americas Program at the Carter Center, said recently. "There seems to be more than a coincidence that we're seeing charges leveled against most opposition figures and political rivals." Richard Feinberg, a Latin America national security adviser for President Clinton in the 1990s, said, "There's no question that Chavez routinely uses the vast powers of the state -- including tax collections and various government agencies -- to pinpoint and harass political opponents. There's a very clear pattern of abuse of state powers for political purposes."